Self-help writers are right: creating effective habits makes you successful in achieving your goals. No need to rely on willpower! A new habit may be the most effective way to reach your goal. Image by Marisha Manahova. Habits make you extremely effective in achieving your goals, argue many popular self-help writers. 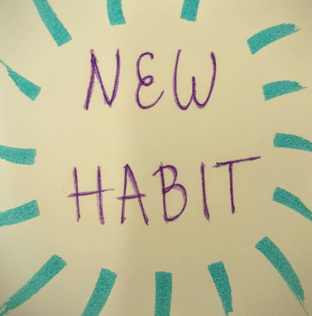 In fact, habits are the new hype in the self-improvement literature. Most authors claim that the best way to achieve a goal is to create a habit that leads to this goal. Science has irrefutably supported this claim. The results from 94 experiments were recently combined to show that, yes, good habits help you achieve your goals more than other factors do. We have all been told that willpower determines achievements: if you really want to achieve your goal, then you will achieve it. However, studies have shown that sheer willpower is not enough. In fact, the strength of your intention to achieve a goal contributes very little to whether you achieve it or not. So what can help you to achieve your goals, if willpower is insufficient? The answer is: habits. To have a habit means to specify when, where, and how you will do an activity, and to actually do that activity repeatedly over time. The results from a meta-analysis that combined 94 social psychology experiments confirmed that if you have a habit which supports your goal, you are much more likely to achieve it. This is what your new habit may look like if you want to go swimming three times a week. Image by Marisha Manahova. 1. Specify a goal and an action. Let’s say you would like to exercise more. What does that mean for you in particular? You may choose to exercise for an hour three times a week, for a month. Also, what type of exercise would you like to do? For example, you may choose to go swimming. 2. Decide when to do the action. Then you need to decide when you will carry out your planned activity. It is best to be specific and pick a time and date for your activities. In the above example, you may choose to go swimming every Monday, Wednesday, and Friday from 17:00 until 18:00. 3. Decide where to do the action. You also need to choose where you will do your activity. For swimming, clearly, you need a swimming pool, and you can pick a pool that you go to every time. For instance, you can choose to go swimming in the swimming pool in your neighborhood. 4. Decide how to do the action. You should also choose how you will do your activity. For instance, you can choose to swim by yourself, with an instructor, or in a class. (Hint: classes where the instructor takes attendance can really help you solidify your new habit.) Let’s say that you decide to go swimming by yourself with a program from a swimming training website. Remember: In order to reach your goal, specify the actions that will lead to the goal and plan when, where, and how you will complete those actions. Good luck! This blog was written by Marisha Manahova. Edited by Marpessa Rietbergen.